Ceja Vineyards is an ultra premium Latino family owned winery in the Napa Valley. It was founded in 1999 by Amelia, Pedro, Armando and Martha Ceja – first generation Mexican-American immigrants. Their dedication to sustainable agriculture and the gentle handling of the grapes in the cellar can be tasted in every sip of their legendary estate grown wines. In 1967, Amelia Morán Ceja emigrated to the U.S. to join her father, a farmworker, who toiled for years in California’s vineyards. Today she’s crossing another border, turning upwardly mobile Latinos into wine aficionados with her subtle blend of viticulture, down-home cuisine and a Web-based marketing campaign. Our entire list of Hispanic Lifestyle’s 2014 Latinas of Influence are invited to participate in our Latina Conference scheduled for April 2, 2014. A strong matriarchal tradition in her family fostered Amelia’s independent spirit, but more than anything, Amelia feels it is flavors and her experience with food that have shaped her life choices. 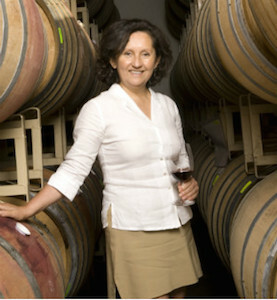 Long before the California legislature recognized Amelia as “Woman of the Year” in 2005 for “breaking the glass ceiling in a very competitive business,” the first Mexican-American woman ever to be elected president of a winery was on the frontier of wine. The dynamo behind more than 140 video blogs since 2009 on preparing Mexican cuisine and pairing it with wine, Amelia has introduced thousands to exciting flavor combinations they never dreamed of. Embracing both her Mexican heritage and American home, Amelia combines the best of what she finds in food and drink, tradition and innovation. “As a minority cellar, we are shaping the wine industry,” explains Amelia, who was honored as the “most outstanding female leader, innovator and visionary in the wine field in the North Bay” by North Bay Business Journal at its 2008 Women in Business gala. Under her leadership, Ceja Vineyards has received numerous awards including: The California Latino Legislative Caucus 2012 Latino Spirit Award. The Spirit Awards recognize those businesses/individuals that exemplify the spirit of the Latino community and have contributed to the State of California. Inc. Magazine selected Ceja Vineyards “Entrepreneur of the Year 2004” (one of seven) in the January 2005 issue. Case production has increased from 750 cases to 10,000 cases per year, and Ceja wines are offered at some of the most acclaimed restaurants in the United States. In addition, Ceja Vineyards was featured on the Wall Street Journal in August 2012 due to Amelia’s focus on wine with food. The article Replacing Cervezas with Chardonnays has had a major influence in the wine industry. “We’re embracing the best in both cultures and tossing away what doesn’t work,” says Amelia. “I don’t want to be homogeneous; my experience is enhancing my adopted country. We’re making both of our cultures better. Why not share what is wonderful—and keep it?” Salud! On May 17, 2013, Amelia received the 2013 Academy of Marketing Science Distinguished Marketer Award. She was selected by the Academy of Marketing Science Board of Governors because of her substantial contribution to the practice of marketing. The criteria include the successful growing and maintenance of a brand, marketing innovation and creativity of an exceptional standard, and engagement with the community through marketing, and most importantly, a strong commitment to marketing ethics and corporate responsibility. The Academy of Marketing Science is a very large multi-national association for marketing scholars and academics. It was founded in 1971. On June 9, 2013 Amelia was featured in the Today Show. The story Ex-migrant worker becomes a vineyard owner was seen by millions and will be instrumental in changing the way Latinos are stereotyped. On October 2013, Sunset Magazine published an in depth story on Ceja Vineyards focusing on Amelia’s authentic Mexican recipes paired with wine. And, Sunset Magazine will publish Amelia’s three cookbooks beginning spring 2015. NextLatina of Influence | Nora de Hoyos Comstock, Ph.D.